Health and Fitness – Page 2 – Three Daughter Dad! 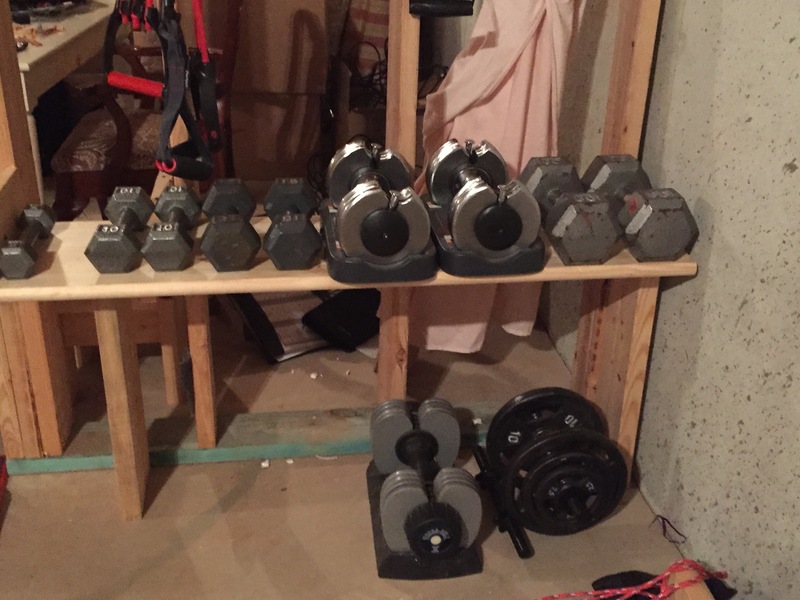 I was tired of my Dumbbells being on the floor so with a $11 dollar investment, i was able to solve that problem. 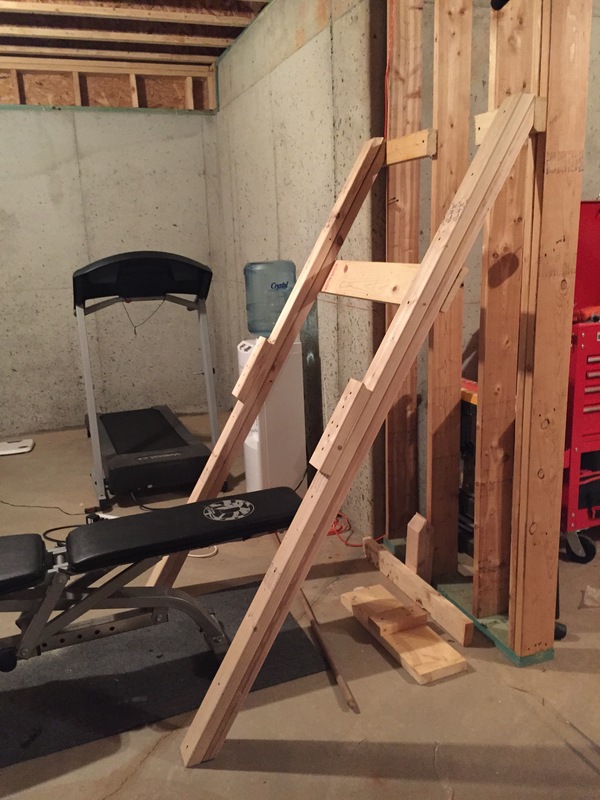 After a trip to Lowes i decided to use a 4′ stair tred from Lowe’s. I like the stair tred because it is thicker than a regular 1×12. 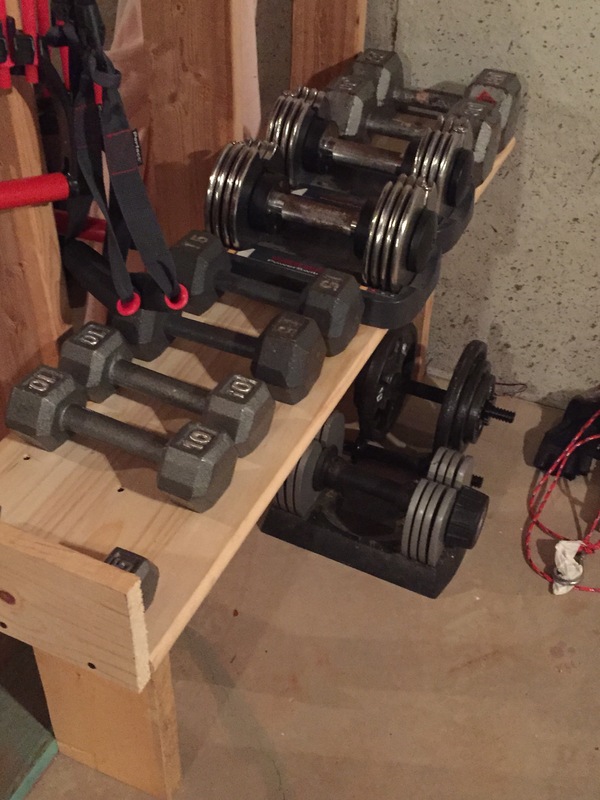 WIth a few scrap 2×8’s from the neighborhood construction dumpster and a 2×4 as a support underneath, I have a functional dumbell rack. Like my other projects some Gorilla Glue and drywall screws holds it all together. 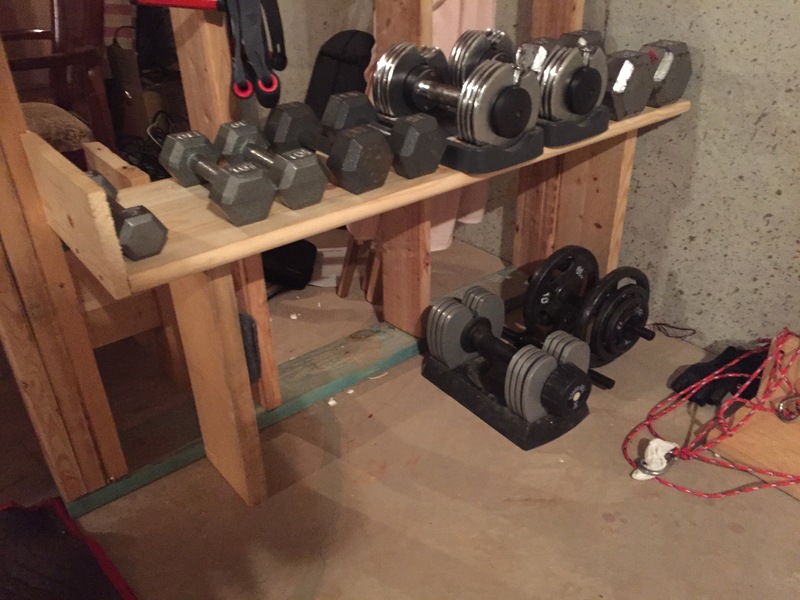 DIY dumbbell rack. Home Gym Entertainment for a 3 year old. When its time to workout, there has to be something besides TV to keep a 3 year old entertained. 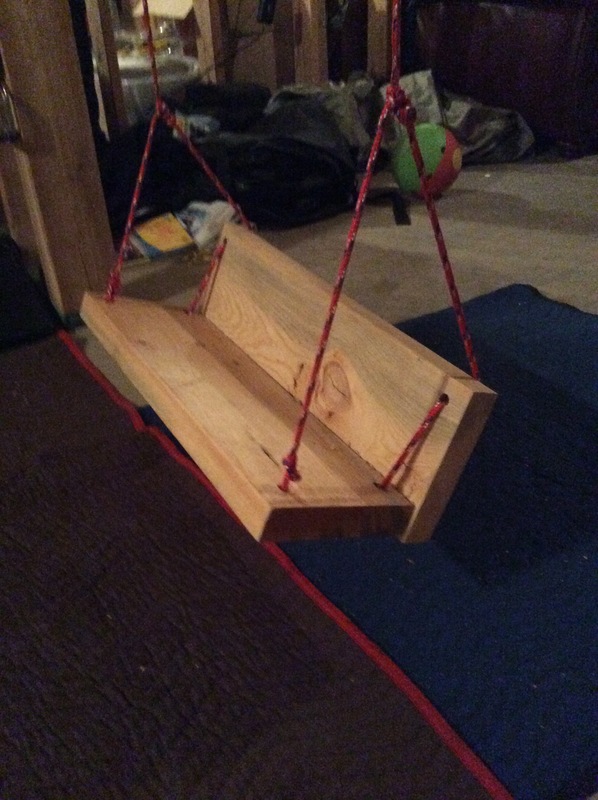 With some scap lumber from a construction dumpster, some 500lb capacity rope, and utilizing the “I” Screws that I use for my DIY suspension straps (in previous post), I made a simple swing that keeps my little one happy. Like we all know, its not the toy, its the box that it comes in that is the most entertaining for kids. So a homemade thing is more exciting than her other toys. Besides, what person would think it was cool to swing in the house. 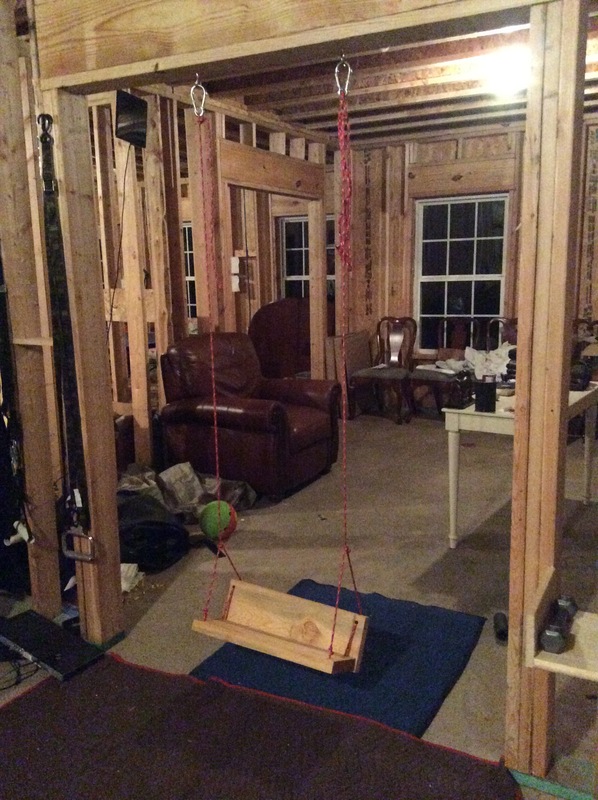 With the help from the littlest of the threedaughterdad goup, we used some scrap 2X8’s, some Gorilla glue and some 3″ dry wall scres to make a swing. 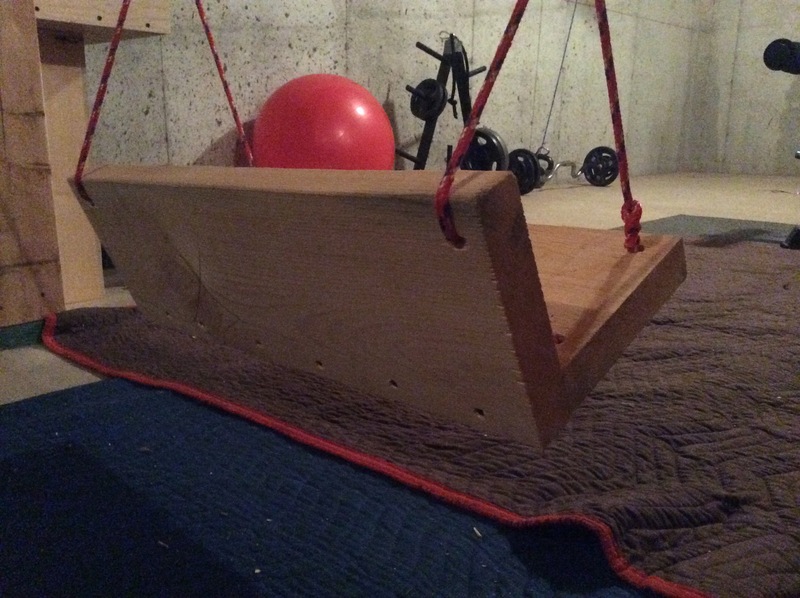 A few holes drilled to make it stable and a couple knots tied in the right places to keep it from tipping, we have a swing that my littlest one loves. Underneath is a Yoga mat and on top of that is a thick blanket folded in half to provide a soft surface underneath. I used a couple of carribiners to make it easy to attach. 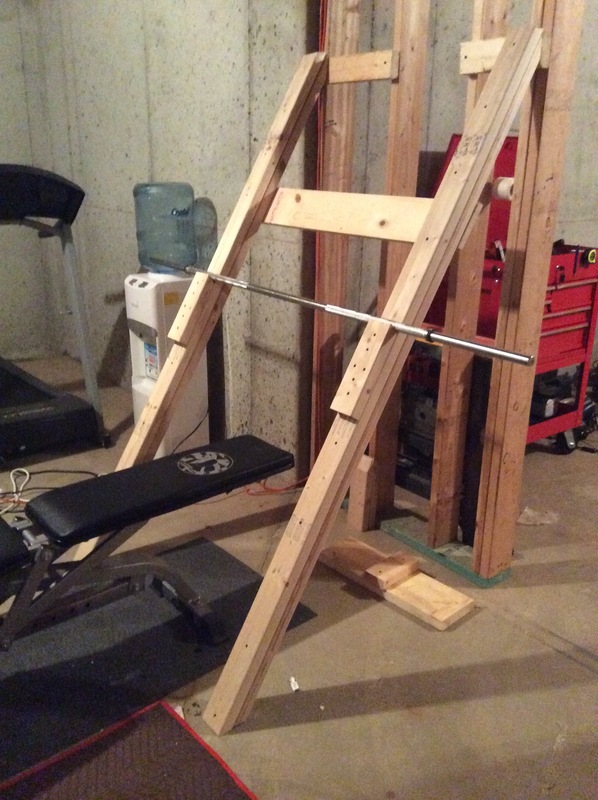 The name of the blog explains why I cannot seem to buy a fancy bench and squat rack. Having 3 Daughters that are involved in sports, cheer, equestiran and of course friends, leaves little money to splurge on Weight equipment. So the next best option is to build my own. Using some $4 2×4’s some Gorilla wood glue and drywall screws, I have a strong and functional bench press and squat rack. 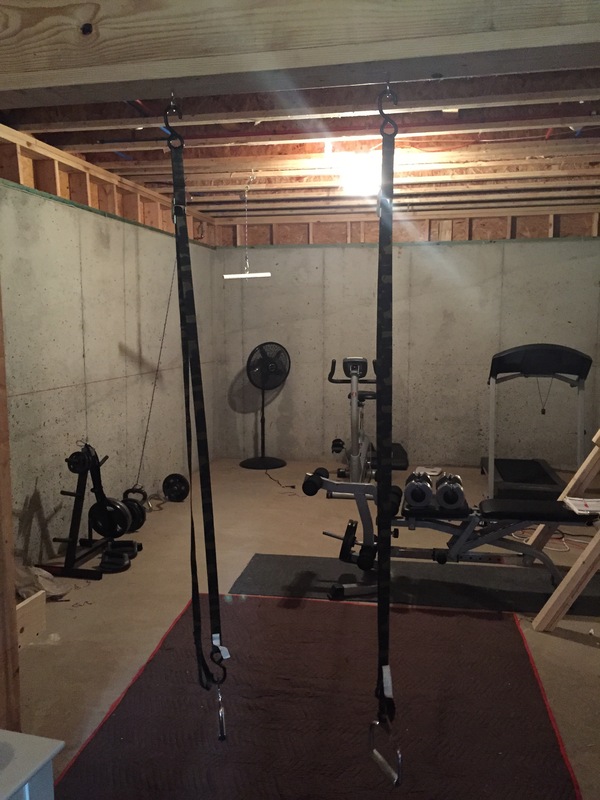 As I considered my options I did some online research and found an awesome DIY power rack on BUFF Dudes youtube channel. Although I love the idea, keeping my cost low was important. If you choose a basic flat bench from Amazon for around $44 and the 2×4’s, for under $65 you can be ready to start lifting. So here is what I came up with. 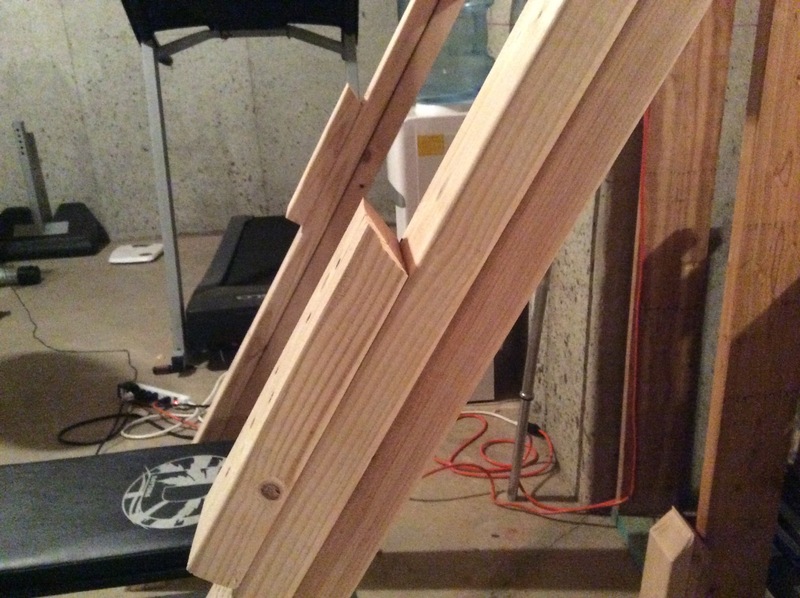 Two 2×4’s glued together and secured with wood screws every 12″. I determined the angles based on my bench and the length I needed from the wall. The bar supports (for now) are the end pieces cut off one of the 2×4’s and screwed on with the angle facing up and out. 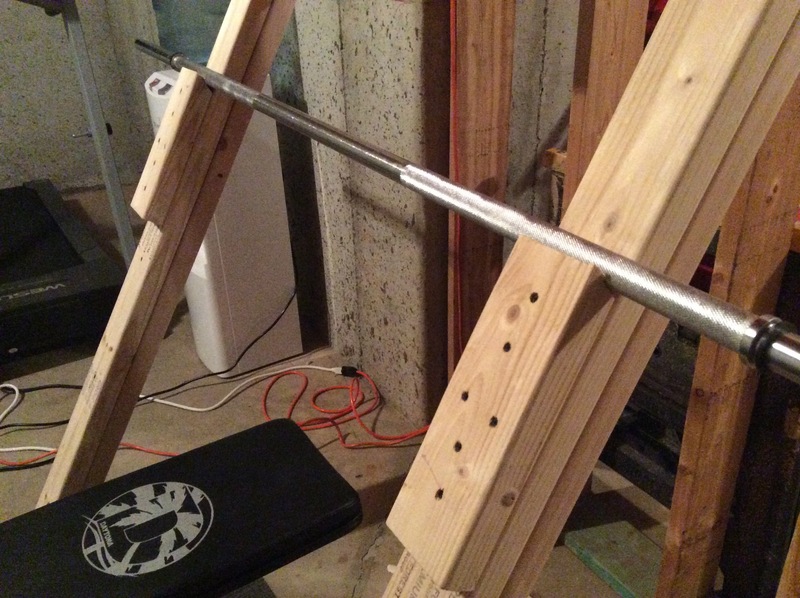 Eventually I will drill 1″ holes in the boards and us a 1″ piece of steel pipe to make an adjustable system so I can place the bar higher for squats. (I will update the blog with Pics when I get that done). This is a super simple way to create your own suspension straps with 1 set of tie downs from home depot and a couple handles from Amazon and your ready to go. That makes them strong enough to handle my weight and the hooks are a perfect fit for the handles. Here are the style of handle I choose. 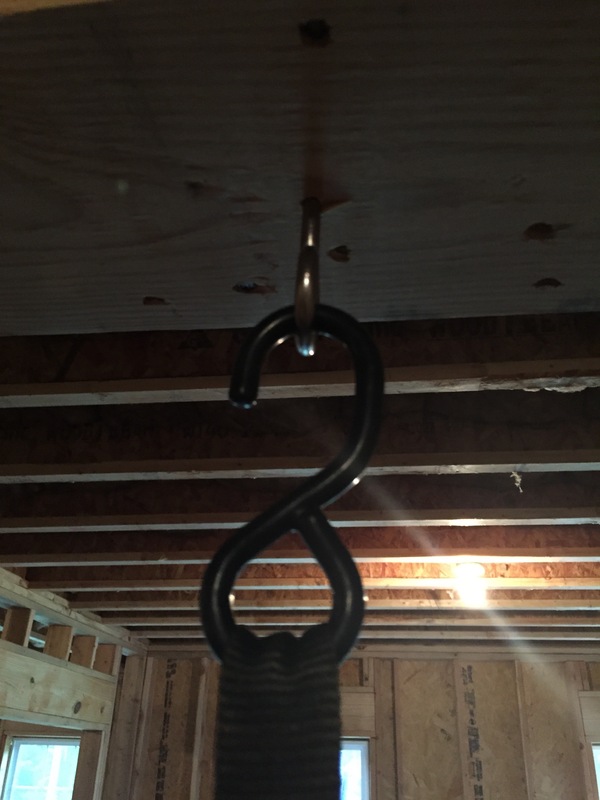 My basement is unfinished so it was easy for me to put two “I” screws (pictured below) in the doorway. Hang them from the hooks, adjust as needed and your ready to go with your adjustable suspension straps. They are easy to travel with and can easily be used at a park or playground by looping over the monkey bars. Heres a quick video of the straps in action. Shake Shake Shake.. Shake your protein. I love my new shaker and from all places Walmart. Just like every other shaker it is a plastic (BPA free) shaker with the little spring ball mixer in it. It was 13.72 at Walmart, but can be picked up on Amazon for 12.59 (Prime Item so two day free shipping). Click here for Amazon Description. 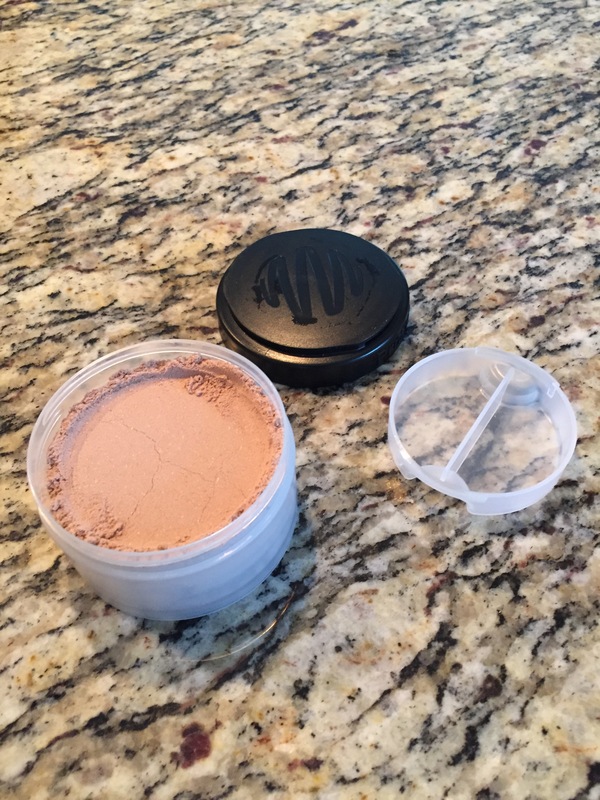 The cool added feature is the little compartment that screws in the bottom that conveniently holds one scoop of protein. But to make it even cooler there is another compartment inside the bottom lid that holds vitamins or supplements. For me, this is great. 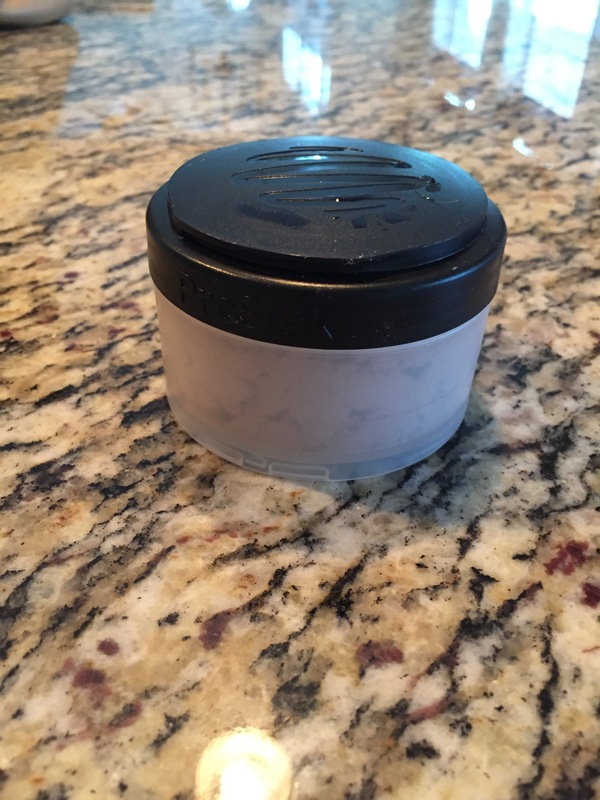 When I travel, I can keep all my protein and vitamins in one neat container. Here is a quick video of it all going together. Shop All Men’s Health Products! No Code Needed!